← What’s a gal to do when she has the power to bring people from another era to her own? Sometimes the truth can be deadly . 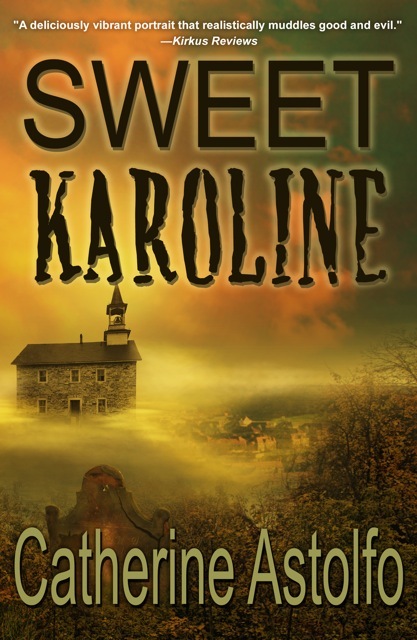 . .
Today I’m featuring the psychological suspense novel SWEET KAROLINE by CATHERINE ASTOLFO. This book has gotten some phenomenal reviews! Critics and bloggers are calling it a “page turner to the end” and “earmarked to be a classic”; “reminiscent of Daphne DuMaurier and Patricia Highsmith”. Writing is Catherine’s passion. She can recall inventing fantasy stories for her classmates in Grade Three. Her short stories and poems have been published in a number of literary Canadian presses. In 2005, she won a Brampton Arts Award. Her short stories won the Bloody Words Short Story Award (second and first) in 2009 and 2010. She won the prestigious Arthur Ellis Best Short Crime Story Award in 2012. Catherine’s novels, The Emily Taylor Mysteries, as well as Sweet Karoline (July 14, 2013), are published by Imajin Books and are optioned for film by Sisbro & Co. Inc. Visit Catherine at http://www.catherineastolfo.com.